This month is host to World Book Day (March 7) and although Halewood may not be Hogwarts, as a responsible business we are huge advocates of helping to improve literacy rates in young people - particularly those in our local communities as we have the people and the skills to make a real difference. 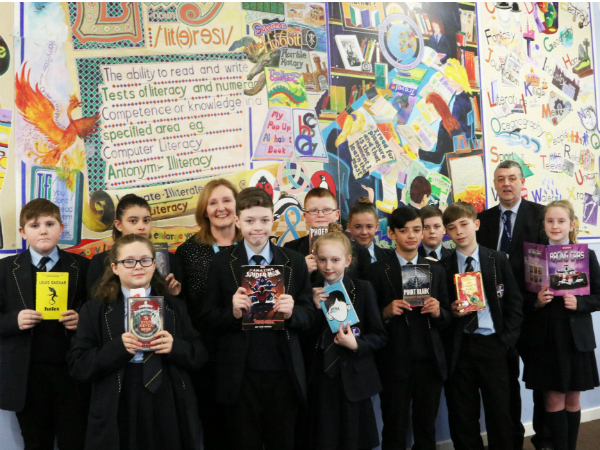 That’s why 18 months ago we opened a new chapter in our partnership with All Saints Catholic High School, in Kirkby, when we piloted an innovative reading programme with its Year 7 pupils. Here PTM speaks to headmaster Tony McGuinness, about why the project was so important and the difference it made to pupil literacy rates at the school. Tony said: “We seemed to be encountering the same problem over and over again with our Year 7 starters which is how the JLR partnership came about. “When the pupils joined us in the September, we found that nearly half of the year’s literacy levels were below the chronological reading age so we decided to take action and implement programmes which would allow them to get up to speed before they started Year 8. “It was at that point we approached JLR, to see if its employees could offer support to our pupils with reading and the results were unbelievable. “Over the course of the eight week programme, ten employees from the plant would visit the school on a weekly basis, where they would do an hour’s reading with each of the pupils. “We measured the children’s literacy rates at the beginning and the end of the course through an online test and in every single case, their reading age increased substantially, by at least a year - this was particularly notable amongst the boys who had seemed to be struggling the most. “With a 100 percent success rate, it just shows what a difference one to one reading can make, not only to the student’s literacy rates but also to their confidence levels which took a real boost. They all loved seeing the JLR team coming into the school in their uniforms and it really inspired them to work hard on their reading.